We (a couple of friends and I) went to the Nadel und Faden (Needle and Thread) yesterday. It was too hot inside (oxygen is not just a good idea, really) and it was to full, but I still had a plast. And a pretty good haul, too. Sheppard: Well, I’ve got to admit, between you and me, you’re a lot different than our Rodney too. Sheppard: It’s the little things. You like golf, you say “please” and “thank you,” you’re--what’s the opposite of “condescending”? Can somebody loose his or her Stitching Mojo? I think I misplaced mine somewhere. - I've finished three pairs of socks in those three weeks. - I've cast on not one, but two shawls. - I unreaveled one of those shawls after I've knitted 6 inches and I decided that a dropped stitched pattern is not the way to go. I've done about 12 inches on the same wool with a feather and wave pattern. 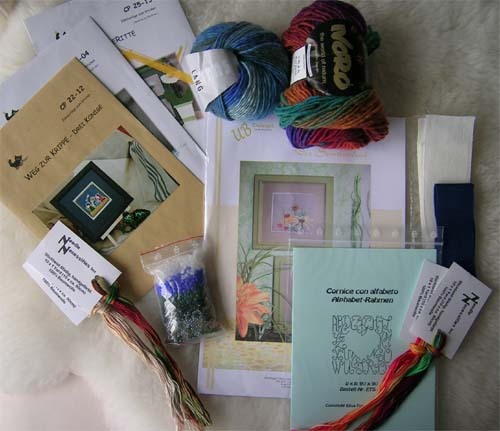 - I've tried to stitch this afternoon on the Northern Lights Sampler and even though I got a little bit of progres, I was still thinking that knitting would be so much faster and I would see more for th TV program. 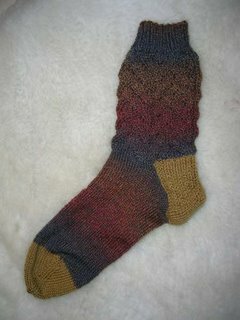 Here's a pic on the first sock for my friends.